Plans for 24 wind turbines west of Harrogate have been withdrawn by Kelda Group, because of ‘community concerns’. This comes just one week after the Harrogate Advertiser revealed that the proposed applications would have led to England’s largest wind farm being built on the Nidderdale AONB’s doorstep. Kelda Water Services (KWS), sister company of Yorkshire Water, withdrew its application for seven turbines at Penny Pot Lane this morning (Thursday February 6). They have also announced that it is no longer pursuing proposals for 17 large wind turbines Scargill South near Harrogate. The company have blamed local backlash for the decision. Gerry Smith from opposition group Save the Dales said he was ‘delighted’ with the news. “That is absolutely wonderful news, I am still a little bit stunned. He added: “The Save the Dales site has been getting lots more hits since the Advertiser article last week, it really prompted a reaction. Tapar Ltd’s application for four turbines off Penny Pot Lane still stand and Infinis are still scoping opinion on their proposals for six 126.5 metre turbines at Lindley Moor. Mr Smith said: “I don’t think Tapar Ltd are likely to follow in Kelda’s footsteps, they are much smaller company and have ploughed a lot of money into these proposals. 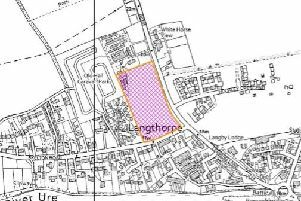 “They are still chomping at the bit to get their application heard by Harrogate Borough Council. See the Advertiser’s investigation into the wind farm application here.